Due to winter weather in the forecast, Friday night’s (Dec. 29) Milford at Edgewood boys basketball game has been postponed. No make-up date has been determined at this time. Cooper Bowls Perfect Game of 300! 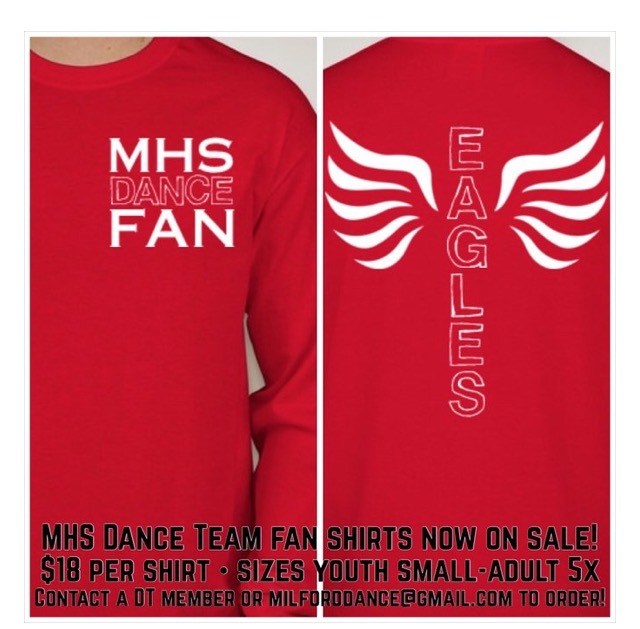 Support the Milford High School Dance Team and see the Cincinnati Cyclones play the Fort Wayne Komets! Milford Dance Team performs at half time! Due to a maintenance issue in the Milford Natatorium, tonight’s (Dec. 5) swim meet featuring the Eagles vs. Loveland and Walnut Hills has been postponed. No make-up date has been determined at this time. 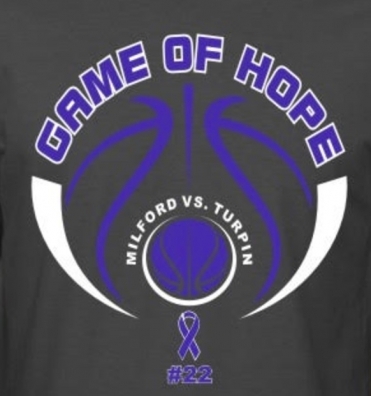 SETTING THE SCENE: Searching for its first Eastern Cincinnati Conference win of the season, the Milford High School girls basketball squad will take to the hardwood for a pair of league contests this week, beginning on Wednesday night against rival Loveland. SETTING THE SCENE: The Milford High School boys soccer squad will chase an OHSAA Sectional Championship when the Eagles take to the pitch against Lakota West on Tuesday night. The game, scheduled to kickoff at 7 p.m. will be played at Lakota East High School. The Milford High School volleyball team, seeded No. 18 in the Cincinnati Sectionals, opened OHSAA Tournament play on Tuesday, 10/17 taking on No. 14 Lakota West. The first set found the Eagles with a strong start, falling just 23-25 to the Firebirds. Junior Justin Horn will represent Milford High School in the OHSAA Southwest District Tournament after he earned one of two individual qualifying slots. The tournament will be played at the Glenview Golf Course and Justin is scheduled to tee off at 10:50 a.m. SETTING THE SCENE: The Milford High School boys soccer team, winners of four straight, will be out to improve upon that number and try to climb the Eastern Cincinnati Conference standings when it returns to the pitch twice before the end of the current week. SETTING THE SCENE: With just three regular season contests remaining, the Milford High School girls soccer team will try to improve its position in the Eastern Cincinnati Conference standings, while also picking up a quality non-conference victory this week. SETTING THE SCENE: With Eastern Cincinnati Conference Tournament and OHSAA Tournament play on the horizon, the Milford High School boys golf team will head to Stillmeadow Golf Course on Thursday for its final dual match of the season, taking on McNicholas. SETTING THE SCENE: Enjoying a solid start to the 2017 season at 4-1-2 overall and 0-0-2 in the Eastern Cincinnati Conference, the Milford High School boys soccer team is back on the field twice in a three day span with a pair of challenging foes awaiting. Summer conditioning/open gym information for Milford High School girls volleyball is now available, including tryout dates. Click HERE for the June, July and August calendars. The 2015-16 Department of Athletics Quality Profile, fashioned after the QP created by the Milford School District is now available for download. Click here to download. All-Conference ECC: Two MHS track and field athletes were named honorable mention for the Eastern Cincinnati Conference’s all-conference . Andrea Armstrong received all-conference honorable mention for the second consecutive season. Milford’s girls volleyball program is holding a car wash THIS SATURDAY, May 27th at Domino’s Pizza on State Route 131 next to UDF. Stop by between 11:00 am and 3:00 pm to have your car washed and support student-athletes in the volleyball program! SETTING THE SCENE: Holding the No. 2 seed in the Cincinnati sectionals, the Milford High School softball team will open tournament play on Wednesday against a familiar foe as they welcome fellow Eastern Cincinnati Conference member Walnut Hills for a 5 p.m.
Milford’s girls volleyball program is holding a car wash THIS SATURDAY, May 6th at Domino’s Pizza on State Route 131 next to UDF. Stop by between 11:00 am and 3:00 pm to have your car washed and support student-athletes in the volleyball program! On Monday, April 10 from 5-8 p.m., shoppers at Kenwood Towne Center will get 10% off their Vineyard Vines purchase, while Vineyard Vines will give 10% back to Milford High School Lacrosse "Stix Up" Boosters - an organization promoting the fastest growing sport of lacrosse and provide support to the athletes of MHS Lacrosse. Due to rain in the area on Friday, Saturday’s Skyline Chili Reds Futures High School Showcase softball game has been rescheduled. Milford and Ursuline will now square off on Sunday, April 2 at 4:30 p.m. The game will still be played on Field #4 at the P&G Cincinnati MLB Youth Academy. The inaugural Milford girls lacrosse season begins Tuesday as the Lady Eagles travel to Turpin for a 7 p.m. matchup. MHS will host its first-ever lacrosse game on Thursday, March 23 when they face Walnut Hills at 7 p.m. The girls are led in their first season by Head Coach Andy Short. Preseason conditioning for the MHS boys tennis season is underway. Conditioning is being held every Tuesday & Thursday, from 2:30 - 3:30 pm. Tryouts will be held March 6 - 10, from 2:30-4:30 pm. Milford’s Competition Cheerleading squad has done it again! The Eagles were named the Cheer Max School Series Grand Champions after compiling the highest score of all teams. The Cheer Max Competition was held on Jan. 29th at the Columbus Convention Center. Seventeen regional high school wrestling teams will travel to Milford this weekend, as the Eagles host the annual Milford Invitational Tournament this Saturday, 1/28, at Milford High School. Action gets underway at 10:00 am in the MHS Main Gym. There will be a meeting on Friday, January 26th at 2:15 pm in the cafeteria for all track team members, both boys and girls. 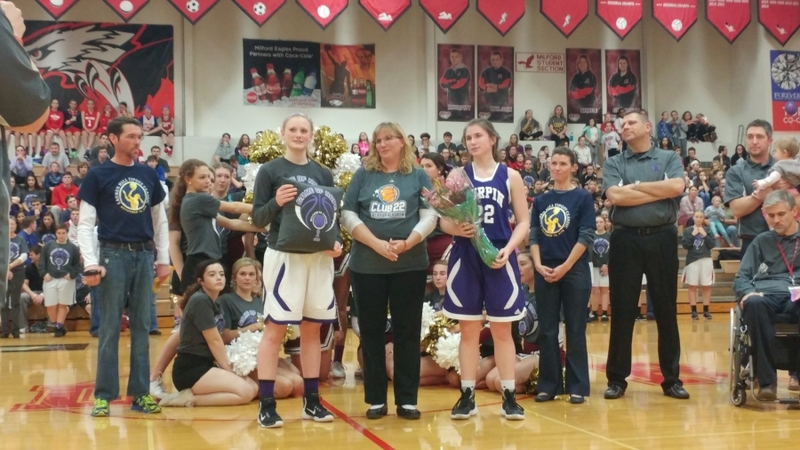 Congratulations to seniors Katey Peña and Jarod Higgins for earning the 'Friends of the Classic' scholarship, awarded by the Southwest Classic committee. The Milford swimming and diving team will compete at the ECC Championship on Saturday, January 21. MHS Cheer Takes 1st; Dance Team 2nd At Annual ECC Championships! SETTING THE SCENE: The Milford’s boys bowling team won the first championship, at the Lancer Baker Bash. Now the Eagles get a breather to start the second half of the season with non-conference Goshen on the schedule for this week. 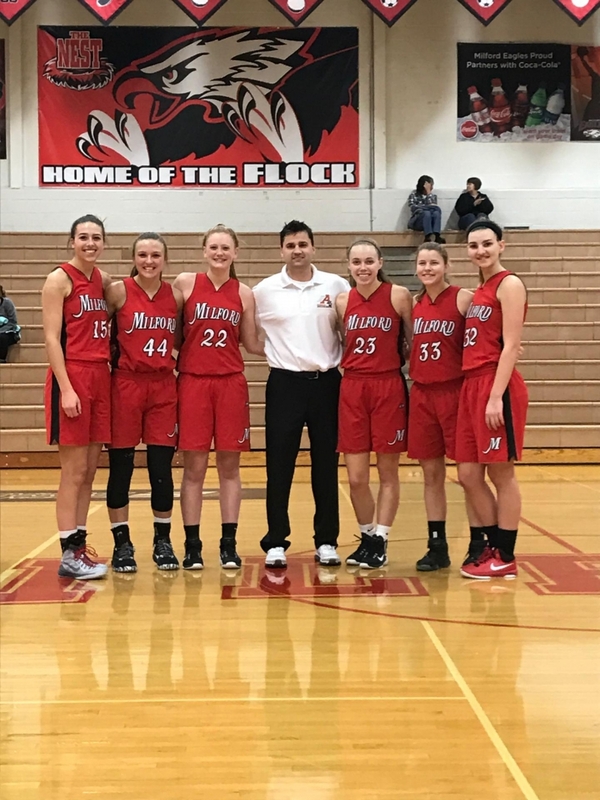 During the 2012-13 school year, five of the six seniors on this year’s Milford High School girls basketball team were members of a highly-successful eighth grade squad that went a perfect 16-0 and captured the Eastern Cincinnati Conference Championship. There will be a girls lacrosse information meeting tonight in the cafeteria from 6-7 p.m. Any interested students are welcome to attend.